The Palestinian Health Ministry has reported, on Wednesday evening, that a teen died from serious wounds he suffered on May 14th, after Israeli soldiers shot him during the Great Return March in Gaza. 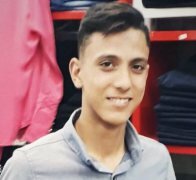 The Ministry said the teen, Mahmoud Majed Gharabli , 16, was shot by an Israeli army sniper east of Gaza city. The teen was shot in the head and remained in a serious condition until he succumbed to his wounds on July 4th.